Marc Marquez returned to the top step at home in Aragon today, for the first time in four races. But boy did the Repsol Honda leader have to work for it. Not only did Andrea Dovizioso (Ducati) fight him tooth and nail, but quite unexpectedly both Ecstar Suzukis, with Andrea Iannone even briefly getting to the front in a particularly fierce skirmish with five laps of the spectacular 5.077-km Aragon circuit outside the town of Alcaniz. Just one man was missing. Pole qualifier Jorge Lorenzo (Ducati) was in the medical centre instead nursing a suspected broken two, having failed to make it round even the first corner. He was pushed wide on the entry onto the dirty part of the track, and even before he’d opened the throttle was thrown high in a vicious high-side. Dovi had done most of the leading, and had fought back from several overtakes that began after half distance. He led at the start of the 21st lap, and they changed places three times before the end of it. From there on Marquez was in control, albeit by the narrowest of margins, able to stay just out of his rival’s reach, and to delight a highly partisan Spanish crowd of almost 63,000. 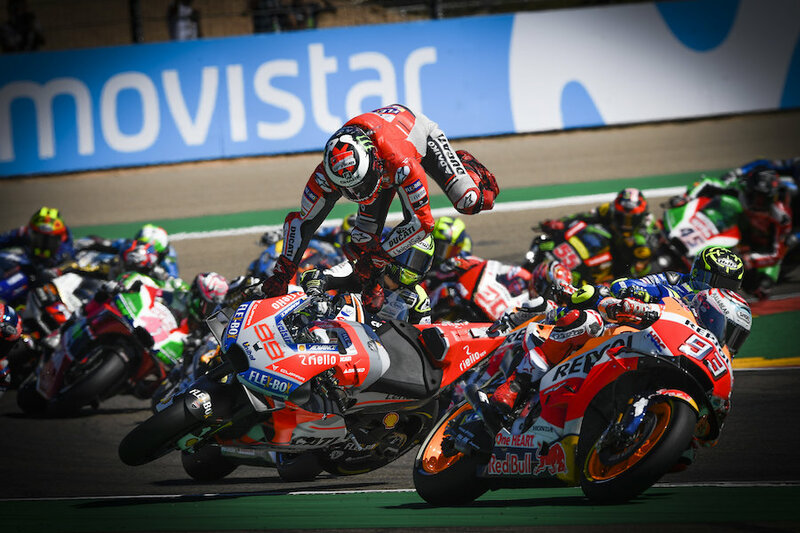 After the Ducati rider’s last failed attack on the final lap, Marquez took victory by just over six tenths of a second. Iannone was a similar distance behind, having finally outpaced younger team-mate Alex Rins. It was a somewhat processional race behind the four-way front fight. 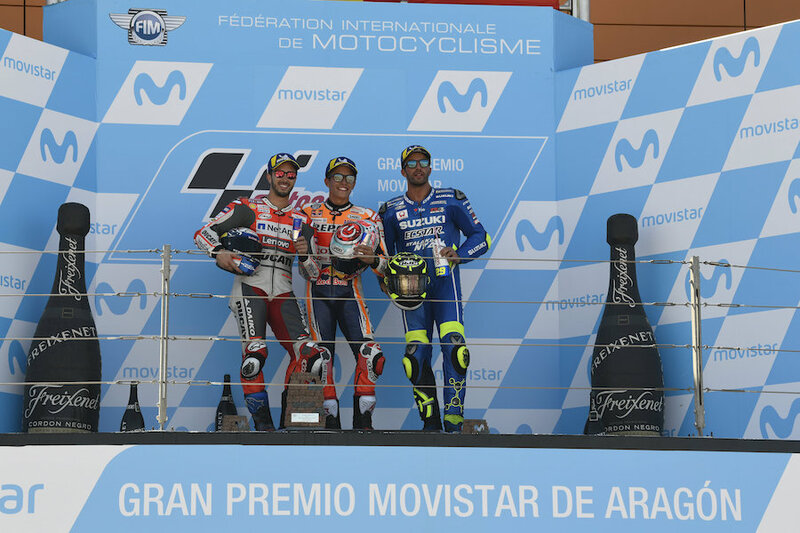 Dani Pedrosa (Repsol Honda) equalled his best result of the season, holding off Aleix Espargaro’s Aprilia. By the end the Italian bike had lost touch, but it still equalled Aprilia’s best-ever finish. Danilo Petrucci (Alma Pramac Ducati) was a lone seventh, while his team-mate Jack Miller lost eighth to Valentino Rossi (Movistar Yamaha) with two laps to go. Rossi was through from 17th on the grid at a bad track for Yamaha. Team-mate Vinales gradually made his way through to tenth, still six seconds away. Franco Morbidelli (EG-VDS Honda) overcame a six-position grid penalty to finish top privateer, narrowly ahead of Takaaki Nakagami (LCR Honda), with both finally ahead of Bradley Smith’s lone Red Bull KTM. Johann Zarco (Monster Yamaha) lost touch with this gang to take the last point. Crutchlow (Castrol LCR Honda) crashed out in the early laps. Marquez strengthened his grip on a third consecutive title, his fifth in six seasons, with 246 points to Dovioso’s 174. With just five races left, there is a maximum of 125 points available. Rossi(159) stayed third ahead of Vinales and no-score Lorenzo (both 130).